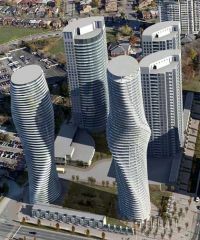 Absolute condominiums are located at Hurontario and Burnhamthorpe. There are 5 towers in total, 50 Absolute, 60 Absolute, 70 Absolute, 80 Absolute and 90 Absolute. Each building offers something unique. There is 24 hour security gate that guards all of these towers. Disclaimer By entering my contact information I give my express consent to be contacted by 'Elena Vankevich, Kingsway Real Estate Brokerage*' and or real estate salespeople on behalf of 'Kingsway Real Estate Brokerage*' to discuss potential services.